Description: Bushnell 10x50 Falcon Porro Prism Binoculars Porro prism binoculars are preferred by most professionals as they provide greater depth perception. A larger objective lens transfers more light thus providing more bright and contrast view, delivering greater details of the image. Bushnell 10 x 50 Falcon provides a high magnification of 10x, which means you would see an image ten times closer as compared to normal eye. 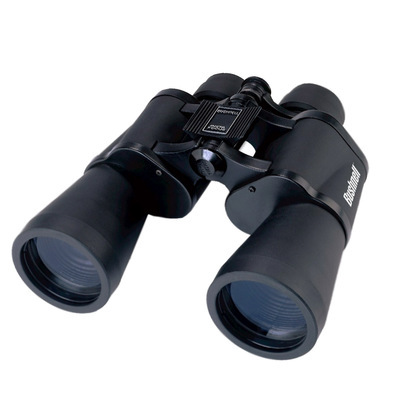 A prominent feature of this Falcon Binocular is its InstaFocus focusing system, which focuses fast, so you don't have to focus manually again and again on a moving object/target. Bushnell Falcon 10x50 provides a rubber armour for a strong grip even wearing gloves, it also reduces shocks and protects the binocular from scratches from daily use.